How is the London-focused business news app faring one month after launch? 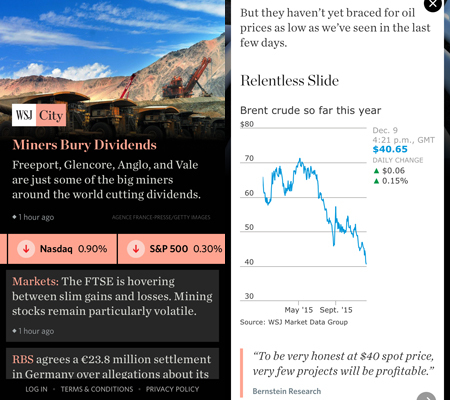 WSJ City launched at the beginning of November as a "whole new concept" for The Wall Street Journal, delivering financial news to London-based readers through an iOS app. The team running the app includes reporters from The Journal as well as Financial News, another title in the Dow Jones family – but none had written for a mobile-only audience before taking on their roles at WSJ City. Editor Phillipa Leighton-Jones told Journalism.co.uk the focus on mobile came from looking at the likely audience for the project. "We thought about not just the type of content we have, but also the type of readers we have, what would be the most relevant platform for them – mobile because they're not always at their computers. "Mobile is something they'll have with them the whole day." 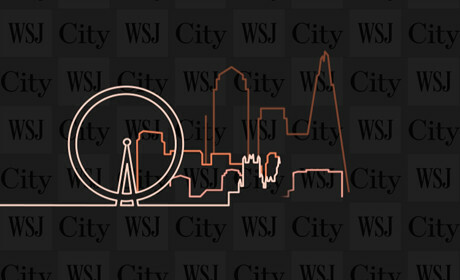 WSJ City features stories from the Journal, Market Watch, Financial News, breaking news that might affect the city of London, as well as live market data. The app publishes stories curated from Dow Jones titles and rewritten for mobile, but the team also produces their own reporting. So what have the journalists learned in their first month of writing for WSJ City? Leighton-Jones explained the team had to start from scratch, as the aim was not to take existing stories and simply republish them on a new platform. Part of writing news for mobile is breaking it down into easily digestible elements, such as bullet points and graphs, which she sometimes calls "bells and whistles". "We try to have at least a couple of elements with each story. Some stories are so context-rich there is a danger to add every single bell and every single whistle." Avoiding this pitfall is "a delicate balancing act" in the editing process, asking "how do I give the reader everything he or she needs without giving them information that's going to distract from the key message". "And then maybe if there's something we take out of the story, we'll rework it in a different way with different context," she said. WSJ City journalists are also in charge of creating any graphs or other elements that may be included in an article, as they have the most insight into the story and can decide what the most relevant format in each case would be. This process has become faster since the launch, and there are plans to grow the data section of the app to make it more timely, as well as expand the types of graphs journalists are able to create to accompany their stories. As the app aims to keep its readers informed throughout the day, it makes use of push notifications when users have opted in to receive these alerts. WSJ City sends about four alerts a day, and Leighton-Jones explained the app might also alert users to analysis pieces related to breaking news events that have been covered extensively elsewhere. Striking the right balance between news and analysis is one of the main goals of the team, and updating each section within the app equally often – such as 'Markets', 'People' or 'Deals' – is important to keep readers interested, she added. More customisation options for users are also currently in development, which will enable readers to decide which section will dominate their homepage in the app. A 'save' feature to allow busy readers to bookmark interesting articles and access them later is also in the works. Each article published on WSJ City can be shared via email, Twitter, Facebook or Instagram. Articles tweeted from within the app, for example, are published with a Twitter card automatically generated for each piece. "As an organisation we quite like the use of cards," said Leighton-Jones. "You can give double the amount of information because you've got the summaries of stories in the card, and you can say something about it in the tweet as well. So we're getting as much as we can out there." The team is currently reworking its sharing options and is about to replace the Instagram button with a WhatsApp feature. She explained the chat app is a more relevant platform for the WSJ City audience, pointing to topic-specific WhatsApp groups used by traders in London. Only one month old, WSJ City is constantly developed to include more handy features for the team, such as access to additional analytics, but also to make the app faster to load and to simplify the sign-up process. An Android version is also in the works – the iOS app is currently available for free as part of a trial, but there are plans to make it available to subscribers only in the future. The WSJ city model could also be replicated in other financial centres around the world, said Leighton-Jones. "I see lots of applications for this and I think it's being looked at by the company as a model for things we can roll out in the future. "